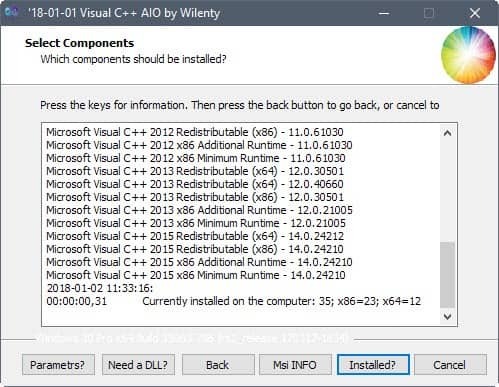 Visual C++ Installer / Uninstaller works similarly to VC Redist Installer which Melanie reviewed back in 2012 and All in One Runtime which I reviewed back in 2009 . It lists available runtimes so that you may install them in bulk on a Windows PC. Inreresting, mine has 40 but really not sure what to do about it. What are the benefits starting fresh or uninstalling or installing. Are the others needed? Why so many? Think we need more info. The benefits are that you free up disk space and remove software that is not required from the system. The downside is that you may run into issues running programs if they still require runtimes that you removed during the process. How does it differ from this, which offers also .NET and more? I’m asking out of mere curiosity. Both seem to do the un-installing and re-installing pretty well. MS did a terrible move by fragmenting runtimes even further into minimal + additional. So for 2015 runtimes you need 4 files on a x86_64 machine instead of the old model requiring 2. I know companies love to just install little as possible. But in 2018 there “should” be a cumulative runtime pack with everything in one installation, though it will never happen. There are some differences. 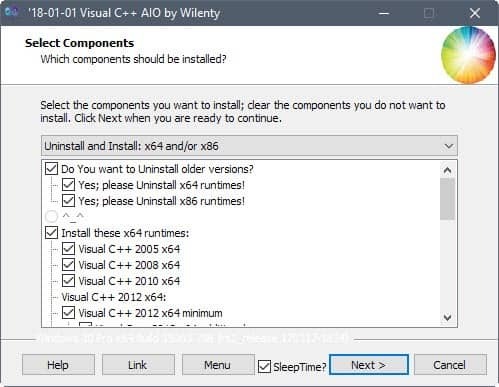 Visual C++ AIO comes with presets that you may like, and it seems to handle the uninstall options a bit better. All in one runtimes supports other runtimes besides Visual C++, and it uses a cleaner interface. The options seem to be pretty identical on first glance though. After installing all (2005 > 2017) manually I let WSUS update them. It’s damn strange and confusing… If you go to Microsoft’s page in order to install ’em manually, you don’t get the latest versions of the packages… Why? By the way, Battlefield 4 for instance, needs the Redist 2012. If I install the minimum version, will it work or do I need the additional, too? Anyone knows the difference minimum vs additional? I simply need some of the packages to run programs/games that require them. If memory serves, only 2008, 2010 and 2012 I need according to progams I have, but got the 2013/5/7 versions as well. I’m pretty sure wasted space, but anyway. Can it just download the latest redistributables, without installing them? I did not try a full installation, but it seems that the runtimes are included in the program download already. So, no extra downloads. The 2015-version of the redists make a phone home regularly. I remember that Microsoft apologized for it. I avoid software that demand installation of that redist. I usually run repacked unattended installers cause I’m tired of these microsoft things consuming my time when setting up a fresh os install. No buttons no options..if one package is installed it skips it. On W7 missing a dll for Photoshop CC19 x64 from the C ++ 2015 on his package, useless to me. On windows XP the latest version is 2015, and 2017 from windows Vista and up, 2015 is only installed on XP, and 2017 from Vista and up. In the summary box below the article.